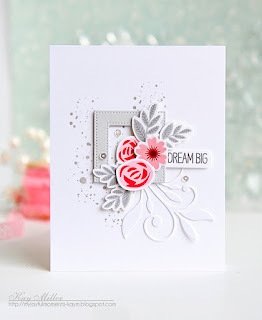 Hello dear friends: I recently purchased two Penny Black stamps after seeing THIS VIDEO by Virginia Lu, one was the "Gentle Whisper" that I used to make THIS CARD and the other one is called "Pure Iris" which I bought because it's just so beautiful. I follow Virginia's technique just like with my first card, I was totally blown away by how easy this was. Here is my card. Now, I saw THIS OTHER VIDEO by The Frugal Crafter in which she uses, of all things, Crayola markers to color her cards. When I first saw this video I thought this was not possible, after all, Crayola stuff is for, ehmm, kids.....but, having the inquiring mind that I have, always trying stuff at least once to see if it works, I said, what the heck, right? I need to see if this is for real so, I went into the kitchen to the drawer where I keep paper and pencils, crayons, markers, scissors, etc. for my youngest grandchildren when they are here and found a plastic bag with about 20 markers still in ok condition so, I took it to my craft room and well.....the result really surprised me. The markers were a bit dry but, since you have to spray the stamp with water, it really didn't matter to much, I did have to stamp the image 2 or 3 times, specially the leaves but, all things considered, this came out really nice. Ok, the sentiment is from a Power Poppy set called Simply Camelias, here is a look at the inside of my card. The sentiment is from a retired Flourishes set called "Tulips for Friends" and the bunch of Irises from another retired Flourishes set called "A Year of Flowers 2". I inked up this stamps with the same markers. I'm submitting this card to the following challenges. Time Out Challenge, CAS with the optional twist of PURPLE to wish Sandy a Happy Birthday. Addicted to Stamps and More CAS challenge #194. This are the retired stamps I used. 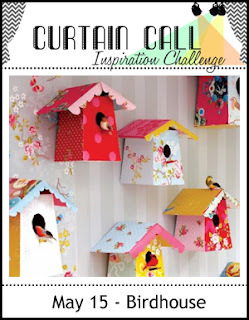 Hello dear friends: I know we are in the middle of Spring but the Curtain Call Inspiration Challenge is all about bird houses so I made this card with one of a few stamps of bird houses I have. I'm also entering this card to the Ruby's Rainbow challenge #129, we are asked to use a transparent element on our card, this is Vellum but it's the thicker kind, I hope you can see it. I stamped the sentiment on a piece of it, I promise you, I used Vellum for this card! This image is called Tree Trunk Bird Houses from Northwoods Rubber Stamps, love this scene. I stamped it onto a piece of thick Vellum because I wanted to try to color it with my SU markers in the back, which came out really pretty. I added a few "snowflakes" with a gel pen. The pattern paper is from Lili of the Valley and the sentiment is from a retired Flourishes set. I like what it says, Nature is all around us, we just have to pay attention. Here is a look at the finished inside. I also love this sentiment, small acts of kindness mean a lot and they will reward you, I feed the birds and the other little critters around my house and they return the favor by allowing me to see their beautiful feathers and furry bodies come to the feeders every day. I've even seen the babies being fed perched near by and baby squirrels and chipmunks eating the seeds, just beautiful and grand. Hello dear friends: I just recently purchased the Botanical Builder Framelits Dies and I'm really having fun with them. This set is an investment, you can use it for all occasions all year round. The card I made to day is for two challenges, the TIME OUT challenge #56, where we have a beautiful card by Kay Miller and The Challenge #73 Inspiration Photo Challenge, here is my card. I did my very best to CASE Kay's card, I love the stitched frame she used but I don't have it so I used the Spellbinders Fleur de Lis Nestabilities Dies instead. The beautiful little flowers were die cut with the Botanical Builder dies, the flourish is from Cherry Lynn (I think?) and the splatter from Gorgeous Grunge, stamped in Old Olive ink. I added a few pearls to the center of the flowers and around. The sentiment is from a retired SU set called Whimsical Words, from the 2010 Sale-a-bration catalog. Here is the beautiful card from Kay I CASEd. 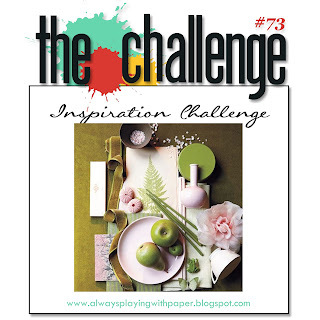 And the beautiful inspiration photo from The Challenge # 73, gorgeous colors. Hello everyone: The time is fast approaching to say goodbye to some of SU favorite sets, well.....some of mine and this is one of them, "Market Fresh". All of the images are great plus, the sentiments on each are clever and fun. This card is for the Mojo Monday #448 designed by Julee Tilman. I stamped the image onto Canson water color paper with Stazon Jet Black ink and colored it with SU markers and the aqua painter, the strawberries were given several coats of Real Red and then, some more coats of my red Prismacolor pencil. I die cut the image with a Flourishes die from the set called "Berry Sweet", I love the pierced detail. The pattern paper is from Lili of the Valley, the little heart punch is very old, I bought it at my local craft store and it's from "Punch a Bunch". The sentiment and strawberry are from a Flourishes set called "Strawberries", the frame from "Country Charm Labels"
and the stamps that I used to create it. Hello dear friends: I love the Purple Onion images, specially Stacey Yacula Christmas collection. Today's card was made with the Christmas Tree and the Elm the Puppy rubber stamps , I'm submitting this card to the Muse Christmas Visions and the Sweet Stampin' Christmas May Winter Fun, here is my card. The Christmas Trees were heat embossed in white then, I sponged each one from top to bottom with Tim Holtz distress inks in Shaded Lilac, Spun Sugar and Tumbled Glass, I love the beautiful pastel shades I get with this inks. The Joy die cut word is from a Penny Black die set called Love and Joy. The little puppy was stamped onto a piece of Strathmore Multi Media 90lb. water color paper and fussy cut with my paper snips and the exacto knife and placed on the panel with dimensional foam adhesive, I'm getting better at using my exacto knife but, I found out the hard way that, for intricate and delicate images like the bow on the box top, it's better to reinforce the back with a couple of pieces of scotch tape, that way, when you go at it with the knife, the pieces cut better and wont rip off, this paper is let thick than the usual paper (Canson 140lbs.) I use but it's great if you want to fussy cut your images. The sentiment is from Power Poppy's Cozy Cupfuls which has the most adorable images and the mitten is from my go to set for the inside of my cards, Merry Littles. 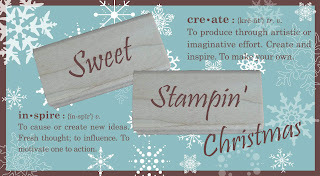 Simon Says Stamp Monday Challenge Blog. 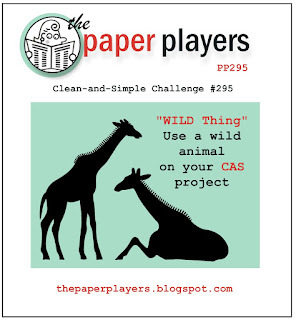 Hello dear friends: Father's Day is just around the corner so I'm making another masculine card, this time, with the awesome help of The Paper Players challenge from LeAnne, "Wild Thing" theme, asking us to use a wild animal in our CAS card, here is mine. I struggle with masculine cards and making CAS masculine cards.....well.....that is double trouble but heck!! I'm adventurous, right? I honestly tried to keep it as CAS as possible, I didn't add any layers, I just die cut the frame with the Labels Collection dies, one for my handsome lion, the next die for the frame around it and the last cut was on the panel, I added just 3 brads and the sentiment stamped on vellum. I again, combined several stamp sets to complete this card, the lion is from the beautiful and retired SU Zoo Review, stamped onto Canson water color paper with Stazon Jet Black ink and colored with SU markers and the aqua painter. The "pebbles" on the ground are from the "Gorgeous Grunge" set, the sentiment is from "The Wilderness Awaits", which I bent on the MISTI to fit on that banner. The sentiment is from my stash and the trees from SU "Serene Silhouettes", which is retiring. This are the stamp sets I used for my card.